Exciting players of that fact there is no doubt; China’s Yan An and Lin Gaoyuan emerged successful at the semi-final stage of the Men’s Singles event at the Seamaster 2017 ITTF World Tour Platinum, Hybiome Austrian Open in Linz on the evening of Saturday 23rd September. Arguably both caused upsets according world ranking but not when previous results and recent form were taken into consideration. Yan An, the no.7 seed, beat compatriot Fang Bo, the no.3 seed and winner four years ago in 2013 when the tournament was held in Wels, in a full distance seven games duel (11-9, 9-11, 11-8, 7-11, 6-11, 11-8, 11-6). Immediately following, Lin Gaoyuan, who had been required to compete in the qualification tournament, overcame Frenchman Simon Gauzy, the no.4 seed (11-7, 11-4, 7-11, 11-6, 11-5). The win recorded by Yan An repeats his success of earlier in the year when at the semi-final stage of the Men’s Singles event at the Seamaster 2017 ITTF World Tour Hungarian Open, he had beaten Fang Bo in four straight games. “In the last game, I made some changes to my serves, I was more firm with implementing my tactics and getting the ball back and I played more confidently as compared to the previous few games. Tomorrow against Lin Gaoyuan, we are teammates, he just beat Fan Zhendong to win the Asian Cup and he’s strong with his skills and strategies. He’s one of the top players in our team here in Austria, so I’ll put myself in a humble position to fight against him”, Yan An. 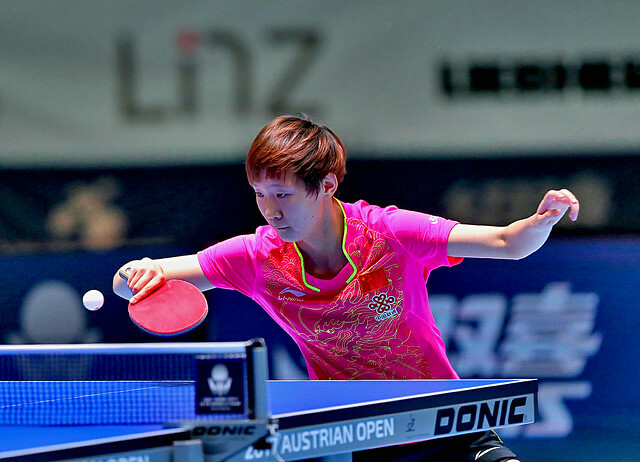 Overall in Linz it was the fourth meeting between Yan An and Fang Bo in an international event; in addition to the Hungarian encounter, Yan An had prevailed on the GAC Group 2015 ITTF World Tour in Japan but on their first encounter had experienced defeat. He lost to Fang Bo in the final of the Boys’ Singles event at the 2009 World Junior Championships in Cartagena de Indias. Meanwhile for Lin Gaoyuan it was his fourth meeting with Simon Gauzy in a world ranking event. Previously, he had emerged successful at both the Volkswagen 2009 and Volkswagen 2011 World Junior Championships, as well as earlier this year at the Seamaster 2017 Hungarian Open. “I’m happy with my performance today, although our match started very late, I’m still feeling very well mentally and physically and was very active on court during the match. I’m looking forward to the final tomorrow since it’s my first World Tour final appearance, and it’s against my teammate Yan An whom I know very well. We are in the same club and under the same coaching team so tomorrow I’ll just go to play my best”, Lin Gaoyuan. The final will be played on Sunday 24th September.